We still have a few spaces on some awesome trips. A great mixture of wrecks, reefs and wildlife. For more details on each trip, click on the title link. 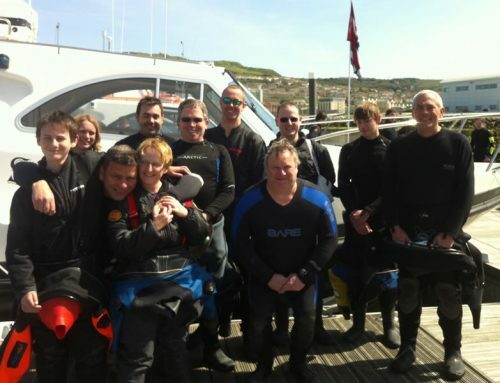 8 dives over 3 days for £235 including 2 nights B&B! The dive plan: Friday 14 June 1.30 pm the Glan Mire followed by a scenic in the St Abbs marine reserve or Black Carr where Wolf fish hang out. Saturday 15 June, we’re heading over to May Island diving Bass Rock on the way, the U74 submarine and Primrose, plenty of seal action over at the Island of May. Sunday 16 June, we’re diving Catherdal, followed by the Glan Mire at 11 am – this wreck deserves a second look, it’s BIG and beautiful and the President! We should be ready to head back around 4 pm. Departing from and returning back to Menai Bridge on Protector, our dive boat for the week, doing one dive on both journeys (Monday & Friday), and 3 dives each day on Tuesday, Wednesday and Thursday, so 11 dives plus 4 nights self-catering accommodation for £438. B&B accommodation option also available, if you prefer for a bit more. As this trip includes the August Bank Holiday Monday, it’s only 4 days off work! Includes 12 amazing dives of 6 days plus B&B accommodation for £565!